April 22-23: Earth Day Sale – BOGO Capsules Shop Now! The Doberman Pinscher breed was created by Louis Doberman in Apolda, Germany near the end of the 19th century. Louis Doberman was a tax collector that traveled door-to-door. He sought out to create a dog breed that could accompany and guard him throughout his day. The exact mix of breeds that the modern Doberman was created from is unknown, however, it is believed that they contain traits from the German Pinscher, Rottweiler, Weimaraner, Manchester Terrier and Beauceron. The end result is a breed that nearly everyone has seen at some point in their lives. The first generations of Dobermans were broader in the face and more heavy-boned compared to their modern descendants. Over time, breeders have prioritized the terrier traits, creating the sleek modern Doberman we have today. The breed turned out to be incredibly popular, with the first breed club appearing by 1899. The first Doberman was brought to the United States in 1908, which was the same year it was first recognized by the AKC. The Doberman Pinscher breed experienced immense popularity through the 20th century. Their alertness, agility, and guarding ability are characteristics that made them particularly suited to police and military work. The Doberman served alongside Marines in the grueling Pacific campaigns of World War II and gained renown attention as steadfast and brave companions. Over time families around the United States began to see that Doberman’s made for great family dogs. Dobermans are a medium to large-sized dog, with males standing 26-28” tall and females standing 24-26”. Dobermans weigh between 65-90lbs and are compactly built, muscular, and exceptionally fast. Despite their size, they have a remarkable amount of energy and can keep up with the most energetic human companion. The Doberman Pinscher breed is distinguished visually by their sleek, muscular look, and coloring that can be either black, red, blue, or fawn combined with tan markings. Doberman Pinschers are natural guardians, and this characteristic permeates nearly every other aspect of their personality. Dobermans are incredibly alert, they are great protectors, and they are adventurous companions. Despite their suitability as police and military dogs, Dobermans are also considered excellent family dogs. It’s important to note that these dogs can have a sensitive personality, especially when it comes to their family. Regardless of this, they still showcase exceptional loyalty to the ones they love most. Dobermans are considered one of the easiest dog breeds to train in the world. Their alertness, intelligence, and ability to understand and follow commands all help in their trainability. Although they are eager to please, they are sometimes known to test their owners by misbehaving. Dobermans require their owner to be a calm and firm leader, or else they may begin to ignore commands. Dobermans are also known to sometimes be aggressive with other dogs, so socialization training from a young age is important. It is important as a Doberman owner to begin training early and to be thorough and consistent. A Doberman needs an owner that is gentle yet firm. They need to show that they are the Alpha of the relationship. If this is properly done, you will avoid many of the Doberman Pinscher behavior problems that accompany a lack of training. Dobermans are a high energy dog, so they need a lot of exercise. It is recommended to bring your Doberman on a very long jog or walk, or a strenuous run, daily. On the weekends consider increasing their exercise with a longer run or hike. Without this minimum of exercise, you may experience some of the behavioral issues that accompany their pent up energy. A healthy breed, a Doberman Pinscher lifespan ranges on average anywhere from 10-13 years of age. The Doberman Pinscher is currently ranked as the 15th most popular breed in the AKC. Although Doberman Pinschers are an incredibly popular breed, they are commonly found in shelters due to their unsuitability with some types of owners. Dobermans need an attentive owner that is able to give it both the exercise and training that is necessary to reach their full potential. Both of these demands mean that owners must have the time, knowledge, and correct mindset to be a Doberman owner. Be sure to feed your Doberman a dry food with quality ingredients. Your food should include high-quality proteins and vegetables, and avoid grain based fillers such as soy, wheat, and corn. How much you feed a Doberman will depend on their size. For example, for an 80lb Doberman, you should be feeding them 4 ½ cups of dry food a day, split into two equal portions to avoid bloat or gastric torsion. How much you feed your Doberman will depend on their activity levels, as well as the quality of food you feed them. For a highly active dog, you may be feeding them more, but a less active dog may be fed less. Similarly, high-quality foods generally require you to feed your dog less, simply due to the fact they are easier to digest and your dog needs to eat less to get enough protein and other nutrients. Dobermans have very low grooming requirements. Their short coat should be brushed weekly, and their nails should be kept trimmed. Just like with any other breed, make sure to brush their teeth once a week to avoid dental health problems from bacteria or tartar building up. Also be sure to regularly check and clean their ears to avoid infections. Are Doberman Pinschers Good with Children? Dobermans are good with kids once they are properly trained to accept commands from them. Dobermans are guard dogs above all else and will guard their family against any danger. Many families who own a Doberman consider them the ideal family dog. They are steadfast, they are brave, and loving with their owners. However, because Doberman’s are so alert for danger to family, they can sometimes see a threat during rough playing or something similar. To avoid any issues, it is particularly important to ensure that your Doberman is socialized with other people and animals from a young age, and is consistently and regularly trained to accept commands from all members of the family. Wobbler’s Syndrome: Wobbler’s syndrome, or cervical spondylomyelopathy, is a condition that is characterized by a compression of intervertebral discs or nerve roots in the cervical, or neck region, of the spine. Compression of the discs of the spine happens most frequently in cases of disc slippage, but can also be caused by a bony formation in the vertebral canal. Affected dogs have an altered gait that appears wobbly, hence the name of the affliction. While Wobbler’s syndrome occurs most frequently in the largest of dog breeds, Doberman Pinschers have the highest rate of incidence of disc slippage, and consequently are at much higher risk to develop this disease. One of the primary signs of this conditions to look out for is a change in your Doberman’s gait, which will be distinctively awkward and wobbly. Additionally, stiffness or pain in the neck area, difficulty rising from a lying down position, and weak front limbs are also indicators. Although in the Doberman’s case their genetics make them predisposed towards developing Wobbler’s syndrome, it is believed that nutrition, particularly excessive amounts of protein during growth periods, as well as rapid growth in large dogs, play a role. Cardiomyopathy: Dobermans are susceptible to cardiomyopathy, a type of heart disease. Cardiomyopathy is a condition where the muscles in the wall of the heart are weakened over time. As the muscles weaken they can no longer contain the internal pressure of blood passing through the heart, causing the heart to enlarge. The enlarged heart has to work harder to circulate blood throughout the body, which causes a loss in circulation. Symptoms of cardiomyopathy are shortness of breath, coughing, and swelling or pain in the abdomen. von Willebrand: Dobermans that suffer from von Willebrand’s disease have a difficult time forming blood clots if they are cut. In general, this isn’t a life-threatening condition. However, it is something to be mindful of, particularly because Dobermans are extremely active dogs with high energy levels, which can lead to minor injuries during play time. Gastric Torsion: Dobermans, like other dog breeds, can suffer from gastric torsion. Gastric Torsion is a condition where an excess of food or gas cause increasing pressure in the stomach. As the pressure in the stomach rises the stomach expands in the abdomen, decreasing blood flow to the surrounding tissue and pushing against the lungs, making it more difficult to breathe. As the expansion of the stomach worsens it can lead to volvulus, which is a rotation of the stomach within the abdomen. The primary cause of gastric torsion is overeating, so be sure to avoid feeding your Doberman a single large meal a day. Also be mindful if they exhibit these common signs, including drooling, attempting to failing to vomit, abdominal swelling, and pacing. If you suspect your Doberman is suffering from gastric torsion you should seek medical attention immediately. Hip Dysplasia: For Dobermans, hip dysplasia is a common condition, particularly later on in life. Their large size, genetic predisposition, and shape of their body all make them more susceptible to developing hip dysplasia. Hip dysplasia is essentially a loose connection between the femur and pelvic girdle. Over time, the cartilage between these two bones wears down unevenly, causing a buildup or scar tissue or bone spurs in rare cases. To determine if your young dog has hip dysplasia, your veterinarian can test their hip assembly for laxity. Once a dog reaches the later years of their life, the damage caused by the uneven connection in their hips results in severe arthritis, which can be extremely painful. After giving him a few days worth of the Canna treats I noticed he seemed to be around more. After just 3 boxes he is up and running, begging at the table like the old Jake we knew and loved. Within 3 months, all of his abdominal distention was gone, he gained weight, his coat got thicker and softer, and he was acting like a puppy! 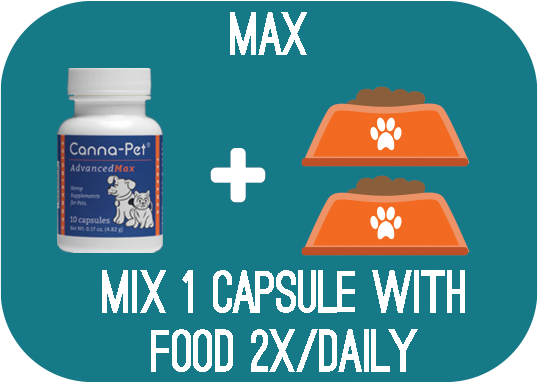 Since using CannaPet she has more energy, less lethargy, and she even looks healthier.